It’s that time of year again where Diageo bring out the big guns and introduce the Australian market to the latest bottles from their Special Releases collection. If you’re not familiar with the Special Releases collection, it’s essentially the one time each year where Diageo take a good hard look at their entire portfolio of distilleries – both open distilleries and long-closed distilleries – and release a series of bottles to celebrate the diverse range of flavours found at each. These bottles aim to showcase distilleries and flavour profiles that you’re unlikely to find in their core range products that are found on the shelves of retailers on a daily basis. Many of these are one off releases; bottles you’re not going to see again in this shape, form or vintage. In its 18th year, we again see some familiar expressions like the Lagavulin 12 year old and an ‘unpeated’ Caol Ila (significant, given all of the standard releases from this Islay distilleries are quite smoky little numbers!) But there are also a number of other interesting bottles in Special Releases collection this time. Some that are interesting because they’re old and rare, and others because they’re young and unusual. Thanks to a generous invitation, I recently had the chance to taste six of the ten released this year in Australia. Up first was The Singleton of Glen Ord 14 year old. Ordinarily, whisky from Glen Ord distillery, or whisky bottled under the Singleton label hasn’t generally been a source of excitement for me. This promised to be a little bit different though, given it had been through a five-wood maturation and cask marriage regime and was bottled at 57.9%. Rich notes of waxy honeycomb, mushy baked apples, zest and sweetness on both the nose and the palate, with a spicy sweet, yet minty dryness on the finish. I was too quick to judge this one. While not super complex, it was really enjoyable and dare I say it – quaffable! You’ll be forgiven if you’ve never heard of Inchgower, as it has always been a significant component of blended whisky, including Bells and Johnnie Walker and is seldom seen as a single malt. Apparently less than 1% of production is bottled as a single malt, so this is an interesting addition to the lineup this year. After the sweetness of the Glen Ord, I found the Inchgower to be quite dry and tight on the nose. It’s quite savoury, with some mossie salty earth notes, damp, coastal, spicy hessian sacks and leather. The palate was also savoury, but with some tropical fruit notes lurking in the background among quite a lot of drying spice. I can count the number of Inchgowers I’ve tasted on one hand, so I’m not sure what the ‘typical’ profile is. Something I’d quite like to explore further. Like the Inchgower, you’d also be forgiven if you’ve never come across Pittyvaich before. Built in 1974, it was one of the youngest Speyside distilleries (most were built a good century or more earlier), but it was short-lived, closing in 1993. On the nose it was quite waxy, with some flinty gingerbread notes, firm stone fruit in the background and a touch of coconut. The palate delivered notes of honey, rich spice, caramel, coconut and some of those tropical fruit notes in the background again (papaya, and green mango). In contrast to the previous two, the one probably doesn’t need much in the way of an introduction. Despite the small size of this western highlands distillery, Oban seems to be a gateway single malt for so many people. The Oban 14 year old was one of the very first single malts I ever purchased, but that’s pretty much where the core range ends in terms of Oban with an age statement on it. So I was quite looking forward to this one. Matured in European oak butts, this has a great deep nose with notes of honey, stone fruit and creme brûlée, intertwined with coastal notes of sea-salt, minerals and damp rock. The palate had a nice connection with waxy honeycomb, creamy rich saline custard, caramelised sugars and ashy char. I really enjoyed this. Cladach – Gaelic for coastline or shoreline – is a blended malt that runs with the coastal theme by including whisky only from Diageo’s six ‘coastal’ distilleries; Inchgower, Clynelish, Talisker, Oban, Caol Ila and Lagavulin. I loved the nose on this, initially getting notes of wood-fired custard, sweet salty spice, zest and smoke, all delivered in a rich, fatty buttery way. The palate completely caught my by surprise though, delivering a big peaty whack, with a tangy saline youthfulness and loads of maritime notes. It’s impossible to not get excited at the prospect of tasting a 35 year old Islay whisky. In previous years, the ‘old Islay’ whisky featured in the annual Special Releases collection was always from the now-closed (but soon to be re-opened) Port Ellen distillery. With stocks ever-dwindling and prices soaring, it seems as though Diageo are holding onto what they’ve got and will be releasing them via other avenues. That’s not bad news though, as this year it has opened the door for this well-aged example from Caol Ila. I’ve had the pleasure of trying a few 30+ year old Caol Ilas and they’ve all been stunning. This bottle was no exceptions, offering a mature nose, notes of pine resin, waxy apples, freshly malted barely, distant peat, aniseed and brine. The palate was oily and rich, delivering waxy fruit, stone fruit, saline, spicy sugared nuts and an aromatic menthol eucalypt notes. On their own, the notes sound bizarre, but the layers, depth and integration of flavour made this something very special in my mind. Thanks as always to Diageo Australia for the invite and the opportunity to taste these special releases. Lagavulin hits the big two-zero-zero this year and to celebrate the milestone they’ve released a trio of limited expressions. At one end of the spectrum there’s a 25 year old Lagavulin matured solely in ex-sherry casks. Then there’s the 18 year Feis Ile bottle that was only available at the distillery during the Feis Ile festival. They’re two expressions that sound absolutely incredible, but probably not what you’d describe as overly ‘accessible’ to the average Lagavulin fan. For that reason, I think Diageo has been rather clever in releasing a third expression, one that the vast majority of us fans will be able to access, afford and enjoy. 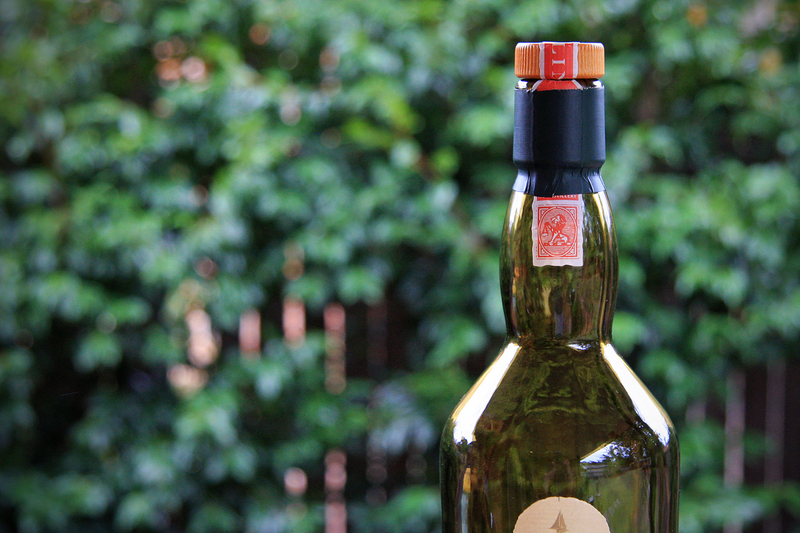 Say hello to the 200th anniversary Lagavulin 8 year old. I’ve got a bit of a soft spot for Lagavulin. If I were to rewind the whisky clock a number of years, I can honestly say that the very first bottle of peated Islay whisky I ever purchased was the Lagavulin 16 year old. I vividly remember the first time I tried it. I was out to dinner for my birthday and being new to the world of whisky I thought I’d try something I’d never heard of. Out came a glass of this smoulderingly smoky, sweet yet salty whisky. At that point, my interest was well and truly piqued. It was the kind of whisky that made me riase an eyebrow each time I brought the glass close to my face and it was barely a couple of days before one of the three bottles on my shelf was a brand spanking new Lagavulin 16 year old. I’m not the only one who’s been charmed by it either. You still regularly see people post on facebook or message forums who’ve newly discovered the world of peat when trying their first Lagavulin. It’s quite incredible to think that the distillery has garnered such a fan base with essentially one core bottle; the mainstay 16 year old. So all of that being the case, I’ve been eagerly looking forward to trying the new 8 year old ever since it was launched overseas back in March and I recently had the chance when I was invited along to the Sydney launch event at The Wild Rover. Diageo National Ambassador, Sean Baxter, was on hand to walk us through the 8, 12 and 16 year old expressions, but before we did so, we were treated to a sensory experience unlike anything I’ve encountered before – a 3D virtual tour of the Lagavulin distillery! I’ve always found the whole 3D goggle thing to be a bit of a kitsch novelty, but using it for a virtual distillery tour? Now that’s pure genius! We donned our branded goggles, put on our headphones and were transported to the isle of Islay. Starting on the pier, we took in our surroundings before moving through to a field of barley, then to a malting room where the raging kiln was charged with peat. The still house was up next, followed by the warehouse and finally to the Lagavulin tasting room. I wish I could have somehow captured the tour itself in photos, but you’ll just have to take my word for it when I say it was pretty damn cool. Our visual and auditory senses weren’t the only ones being tantalised. As the tour progressed, a team of helpers (or as I like to call them, scent ninjas) introduced various scents to complement the scenes. Think being misted with sea spray when we were on the pier, the smell of oak and earth whilst we were in the dunnage warehouse and even the the burning of peat whilst we were checking out the kiln (damn it smells good). Oysters were shucked, canapés were served and some blazing libations were crafted to round out the evening, but not before the hero was sampled. The new Lagavulin 8 year old is solely matured in refill American Oak casks and bottled at 48% ABV. Before I get stuck into the notes, I’ve got to hand it to Diageo for releasing this at a very respectable ABV and with a young age statement boldly (and proudly) printed on the label. Well done chaps! Where the 16 year old could possibly be described as round, even supple, I’d say this is bright, punchy and active. A clean pronounced sweet peat note, oily charred citrus zest, face-puckering lemons, fresh tart pineapple and a salty saline tang. It smells youngish, a tad mescal-ish, feisty and fun. Again, compared to the 16 year old, the palate is noticeably oily and creamy in texture, thanks in large part to the higher alcohol strength and lack of chill-filtering (a very welcome addition in my books). It’s bright and hits the palate high with a sweet rock-salt tang, crisp smoke, smouldering coals and ash before some fruit kicks in (green pears and underripe peach). On the finish I felt it turned sweeter again, whilst being both drying and ashy, with very little in the way of oak or bitterness. The 200th anniversary Lagavulin 8 year old is available in Australia right now at a recommended retail price of $95. A big thanks to Sean and the team from Diageo for inviting The Whisky Ledger along as a guest. My first encounter with the Lagavulin 16 year old was at the end of a memorable meal at a great little Spanish restaurant called MoVida. A week went by and I couldn’t shake the thought of that intriguingly smokey-sweet dram I’d had, so I soon found myself at a local bottle shop purchasing my first Islay whisky. Although the Lagavulin bottle shape is shared with a number of Diageo’s other single malts (such as Caol Ila, Talisker, Cragganmore and Royal Lochnager), the green tinted glass and two-piece parchment style label go a long way to making it stand out as unique. After peeling back the foil there’s a seal over the top of the cork which is a nice touch – a hangover from the pre-foil days I suspect. I’ve contacted Lagavulin to try and find out the significance of this little lion character, but have had no luck as of yet. The barley used for Lagavulin is produced at Port Ellen Maltings. A common misconception is that the germinating barley is dried over a peat fire. At Port Ellen Maltings the barley is dried using hot air produced by oil burners and the peat fire underneath the kiln is only there to impart the smokiness we associate with some of the great Islay whiskies. If you’ve got 10 minutes to spare, this great video gives you a behind the scenes look at Port Ellen Maltings. Waves of organic peat smoke – Think salty smoke notes, with ash and some sweetness. There’s a really nice balance between the three S’s – smoke, sweetness and salt – with none of the three completely dominating the nose. Friends and family have used terms like ‘industrial, old oil lamp and mechanics workshop’ to describe the nose on this! Probably not far off, but it’s much more refined and alluring than those terms suggest. Initially quite oily with some sweetness at the front of the tongue. This is followed by a wave of salty saline notes, peat or ash and some warm prickling, not necessarily from the alcohol though. I almost feel as though it’s the kind of tongue prickling burn you get from something heavily cured or brined. Residual sweetness, really light menthol notes and waves of peat smoke every time you exhale. That wonderful peat smoke fades to lingering salty finish with some faint bitter notes. 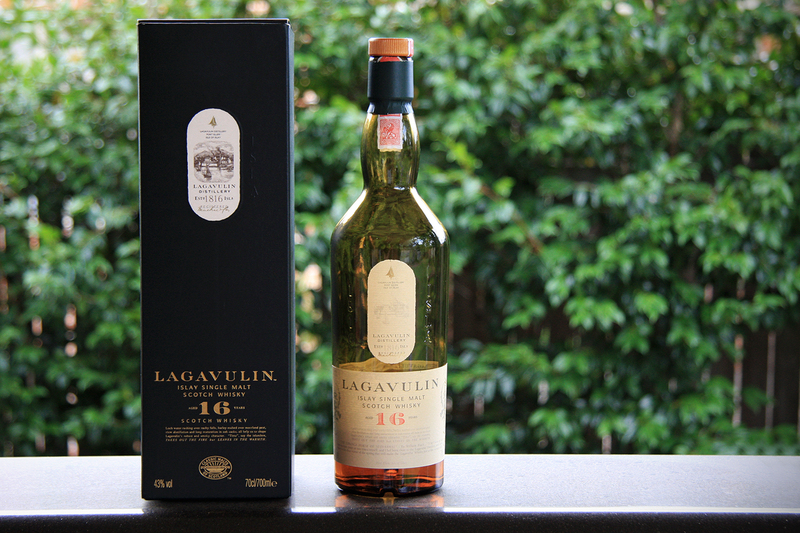 A newly opened Lagavulin 16 hits you with waves and waves of smoke, fresh out of the bottle. I found that pure smoky magic faded rather quickly once the bottle had been opened for a few months, but at the same time it has matured a fair amount and has a lovely balance to it. Make no mistake, you can still smell this one from the coffee table once you’ve poured a dram and sat back in your chair!